Ed Sheeran fans will definitely be tuned in to this. After playing to crowds in Dublin, Belfast, Cork and Galway, there's no denying that Irish audiences can't get enough of Ed's red head. Aside from this, 2018 has been a pretty decent year for the singer after this third album, ÷, became the fastest-selling album by a male artist in the UK. It also topped the charts in 14 countries, including the United States, Canada, and Australia. To top things off, he only went and won a Grammy Award for Best Pop Vocal Album. Not bad at all. Well, Sheeran fans will be given an in-depth look at the recording and touring of ÷ when his new documentary, Songwriter, is released. As the official synopsis states, we're promised" an intimate and personal look into the writing process of one of the world’s biggest artists, Ed Sheeran. Filmed by Murray Cummings, Songwriter details the creation of Sheeran’s third studio album ‘÷’ and gives authentic insight into his life through never-before-seen home videos. Witness his creativity firsthand, from the very first chord to the finishing touch as the sounds become the songs." 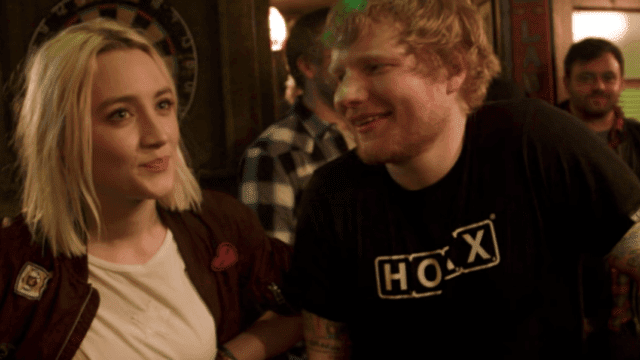 As you can see in the trailer below, there's a very strong Irish aspect to the footage as Sheeran's track Galway Girl soundtracks the majority of the footage. We also have some sneaking suspicions that some of the footage which features was filmed around Ireland. Also, the presence of a certain Saoirse Ronan is very noticeable. After all, that video was filmed in Galway. All will be revealed when Songwriter is released on August 28th, exclusively on Apple Music.